This belt is handmade from genuine, traditional vegetable-tanned Bridle leather from 100% American hides. 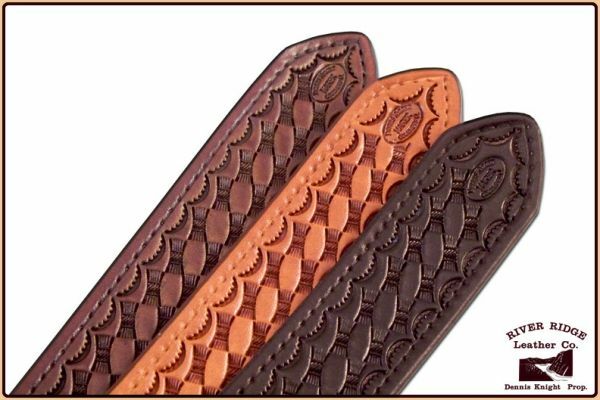 The hand-stamped basket weave pattern is done by Dennis Knight using only traditional leatherworking tools. Available in Black, Medium Brown and Saddle Tan. 1.5-inches wide. Made in all waist sizes with choice of solid brass or stainless steel buckle. Men's belts are typically made one size larger than waist size. Note: Because we use only traditional vegetable-tanned leather and make them one at a time, colors vary slightly from belt to belt.